This Hampden eatery finds success with its forest-to-fork concept. Long before foraging became part of the local lexicon, chef Chris Amendola was wandering the woods, his backpack brimming with ramps, fiddleheads, and chanterelles, as well as paper and mesh bags to hold his forest finds. And while there are many who say they forage in Baltimore these days, Amendola is the real-deal forest whisperer. Go hunting with Amendola and you’ll quickly see that he knows how to “read” the trees, taking note of microclimates and searching for chanterelles under maples, or chicken of the woods protruding from fallen oaks. Although Amendola seems to have a fungal fixation, he embraces anything that’s been locally sourced and is quick to share that there’s a whole generation of people who’ve forgotten where their food came from. “Food comes from somewhere,” he’s fond of saying. It’s not surprising that Amendola’s idea of opening a seasonal eatery started to take shape at the same time he was learning the art of foraging from James Beard Award-winning chef Sean Brock (of McCrady’s in Charleston). It’s also fitting that the former Fleet Street Kitchen chef went for a straightfoward approach in naming his tiny, 26-seat boîte Foraged: A Hyper-Seasonal Eatery. As you enter the space on the former site of Arômes, the décor sets the scene: Black-and-white photographs of farm animals hang against exposed brick walls, carved wooden mushroom sculptures adorn the tables, and window boxes and a verdant hydroponic plant wall overflow with violets, nasturtium, basil, and bee balm that not only bring the place to life but are featured in the food. 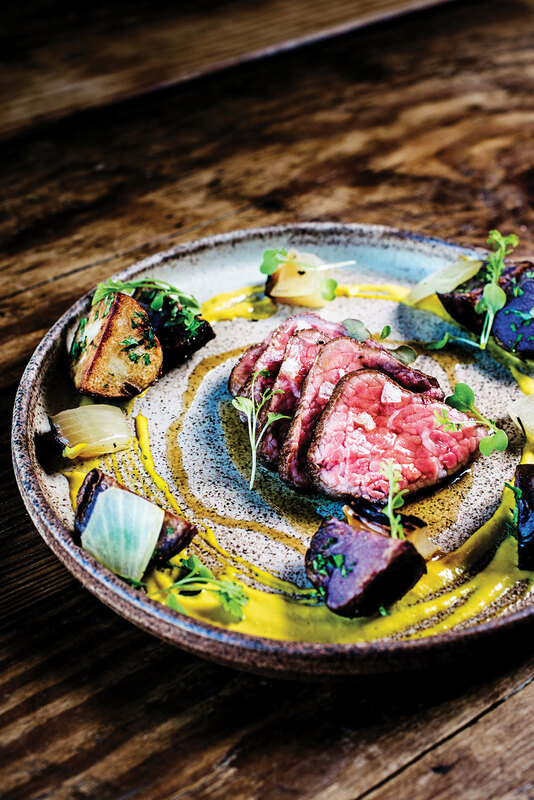 The farm-to-table concept is a lofty one, but when some chefs realize what’s actually entailed, it can get the best of them in the off-season. It’s also the true test of a chef’s ability to be resourceful in tougher times—and Amendola, who works closely with local growers to get the freshest, most local products, proves that he has what it takes to make the concept successful in any season. 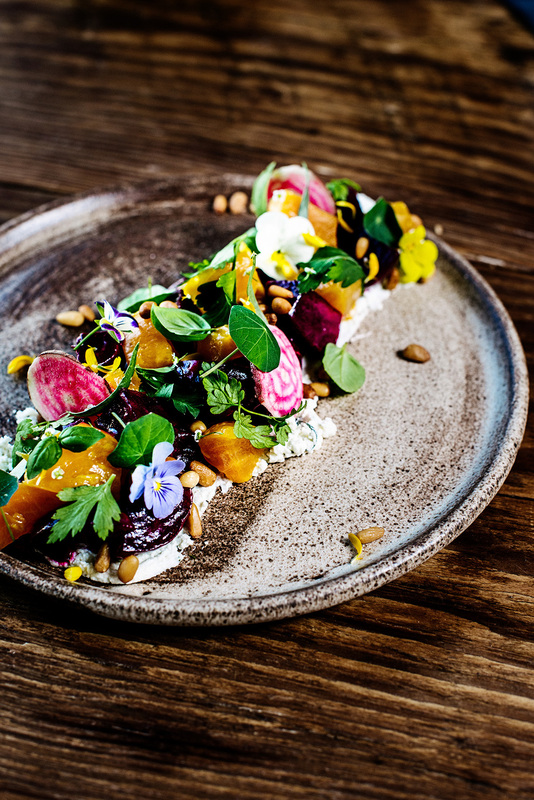 While the menu is concise and rotates daily, there’s plenty to pick from for every palate, including everything from innovative vegetarian dishes to a slew of pig parts (jowl, socket, cheeks). Know before you go that even the bigger entrees are on the smaller side, but pricing is fair (most dishes are below $20), so order accordingly and save room for one of Amendola’s signature seasonal shortcakes for dessert (and also a sweet surprise that comes with the bill). There’s a whole generation of people who’ve forgotten where their food came from. In the depth of December, a plate of sunchokes topped with goat cheese, lemon, herbs, and hazelnuts was bright and beautiful. And diners were no worse for the winter as bowls of rich and earthy mushroom stew studded with pine nuts and ricotta gnudi and topped with a poached egg arrived at the table, while the half chicken with roasted root vegetables was exactly the kind of stick-to-your-bones, satisfying dish you’d want in cooler climes. Spring saw lighter plates such as sea bass with spring vegetable stew and mushroom buns, while summer starred country ham and melon salad and earthenware plates stacked with fried corn fritters. 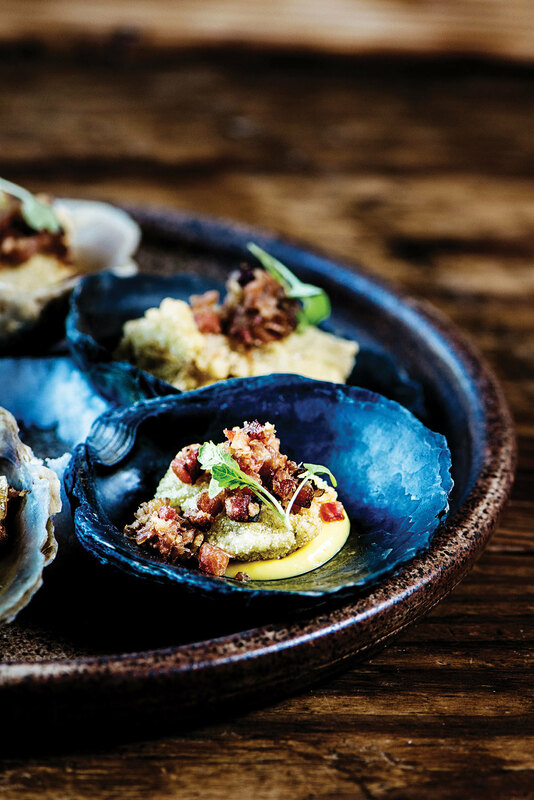 A recent fall visit ushered in dishes such as fried oysters with pickled radish relish and basil purée and an unctuous plate of braised short rib ravioli tossed with the last of summer tomatoes. Toasted baguette slices and a bowl of house-made ricotta with diced peaches also offered a final farewell in the days that bridge the two seasons. With so many so-called farm-to-table spots offering beet this and kale or cauliflower that, we can experience dining-out fatigue on occasion. 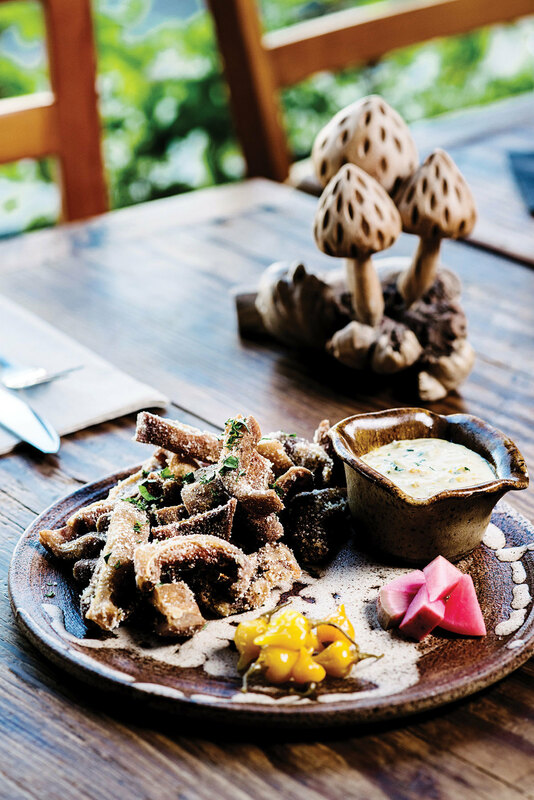 What differentiates Foraged is that whatever—and whenever—you eat here, it will always be interesting. As fall turns to winter and back to spring, Amendola will, no doubt, go into the woods to bring back the best of the bounty—and we can’t wait to see what he does with whatever it is he finds. FORAGED EATERY 3520 Chestnut St., 410-235-0035. HOURS: Tues.-Sat. 5-10 p.m. PRICES: Starters: $9-13; small plates: $12-18; mains: $18-23; desserts: $3. AMBIANCE: Greenhouse chic.